Encompasses a rich seam of current information on the vast and multidisciplinary field of nuclear materials employed in fission and prototype fusion systems. Discussion includes both historical and contemporary international research in nuclear materials, from Actinides to Zirconium alloys, from the worldsâ leading scientists and engineers. Synthesizes pertinent current science to support the selection, assessment, validation and engineering of materials in extreme nuclear environments. 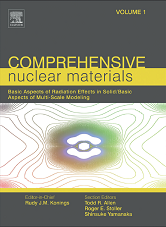 The work discusses the major classes of materials suitable for usage in nuclear fission, fusion reactors and high power accelerators, and for diverse functions in fuels, cladding, moderator and control materials, structural, functional, and waste materials.